UNISON has welcomed the news today (Monday) that the only NHS trust in the UK outside the national agreement for pay, terms and conditions is now to move over to Agenda for Change. It means staff at Southend University Hospital will now enjoy the same pay, pension and annual-leave conditions as everyone else in the NHS. The trust has operated outside Agenda for Change for more than a decade. But it meant staff in Southend were not guaranteed the same pay rises as their colleagues in other trusts around the country. Last year, the trust agreed to mirror national NHS pay rates and, following consultation with unions, it has now agreed to move over fully. 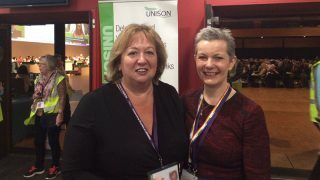 Health workers at the trust belonging to UNISON voted on the changes, with 88% backing the move, which takes effect on 1 April 2019. UNISON head of health Sara Gorton said: “This is great news for staff in Southend, and indeed the NHS as a whole. “Staff are better protected and treated more fairly if UNISON is able to negotiate at a national level. “That’s how health unions secured huge rises for some of the lowest-paid workers in the NHS last year. “For instance, a band two healthcare assistant’s pay rates will have gone from £15,404 last year to £18,005 in 2020. – In June 2018, 84% of UNISON members across the whole NHS voted to accept the three-year pay deal that Southend workers will now join.